Publicity & Art Car Fun! Did I mention that my book cover WON a Facebook contest in October? 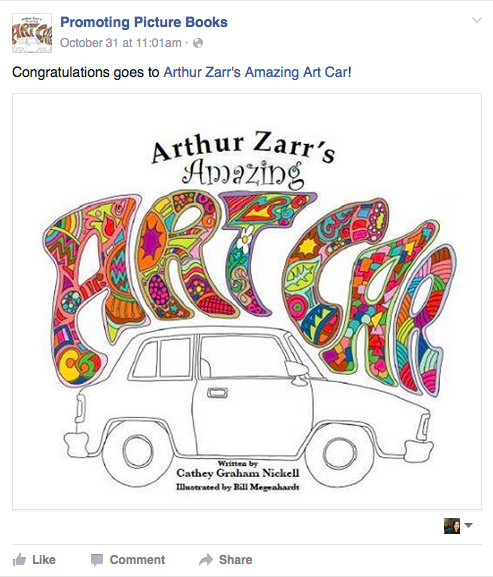 A site called Promoting Picture Books ran a fun contest, and my cover of Arthur Zarr’s Amazing Art Car won! Thanks goes to my amazing illustrator, Bill Megenhardt, who designed the vibrant image on the front of the book and throughout all the inside pages! My new picture book also was featured at the Wilchester Elementary Arts Market, where I had a booth and sold books. Bill was on hand to draw some adorable on-the-spot artwork for the kids! An art teacher at Wilchester, Stephanie Walton, made it all possible! She will also present my book at a workshop this week at the Texas Art Education Association (TAEA) Art Teacher’s Conference, held in Galveston. She helps other teachers learn how to incorporate art cars into their classroom lesson plans. She rocks! Thanks for handing out my bookmarks and flyers at the conference, Stephanie! 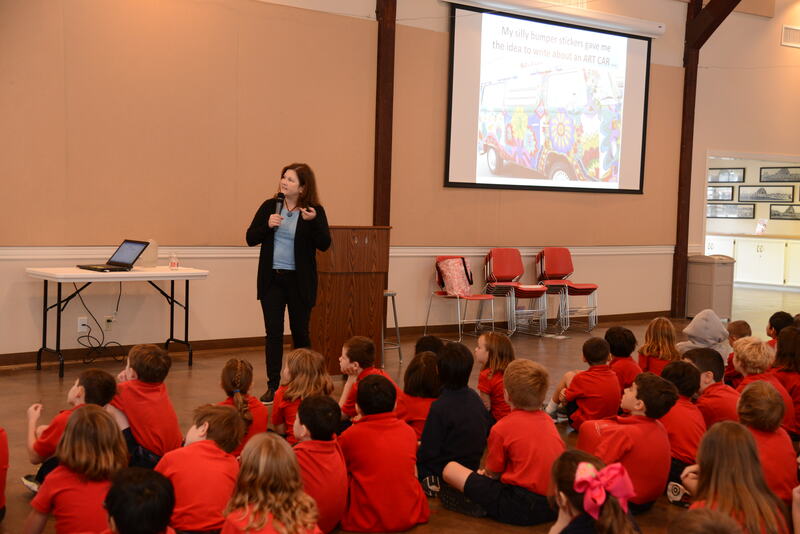 St. Mark’s Episcopal School welcomed me on Nov. 10 for an Author’s Visit. 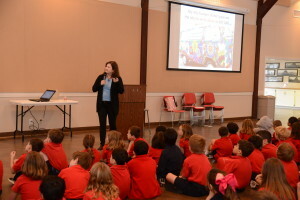 I had a great time talking to the kids in multiple grades about “Amazing Book Ideas: Where do they come from?” They were a fantastic bunch, were super attentive, and asked great questions. Thank you, St. Mark’s, for making me feel comfortable the first time I presented at a school. (Two of my nieces attend this precious school, which made the day even more special for me). You’ll never believe what this Saturday Nov. 14 is … that’s right, it’s WORLD ARTCAR DAY 2015 Houston! Who knew there was a whole day set aside to celebrate these rolling works of art? The Houston Art Car Museum will have a mini-art car making workshop from 12:00 noon until 3:00 pm. Each child will get a toy car and all the paint, glue and accessories they need to create their very own miniature art car. On hand will be local art cars of the Houston Art Car Klub. Check it out here! If I think of anything else going on, I’ll update the post. For now, I think this is plenty. It’s been a busy launch week, but lots of fun! You’re like a machine, Cathey!! You just keep going and going. Well done on your fine achievement. I wish you every success. Thank you, Marisa! I appreciate your words!